Natural disturbance is one of the major topics in forest ecology. However, most paleoecological studies have only considered the influence of wildfire as an agent of disturbance, with fire history based primarily on the use of charcoal as a proxy for fire events. The frequency and intensity of insect outbreaks and their effect on the forest landscape have been neglected due to the absence of an effective proxy tool. Finding indicators able to provide insight into the impacts of past insect outbreaks is therefore essential. Fossil moth (Lepidoptera) scales offer a new approach for interpreting past insect-related disturbances and assessing the interactions between climate, fire and insect outbreaks. Paleoindicators must respond to three main criteria: (1) be in high abundance, (2) allow for easy identification and (3) remain well-preserved in sediment records. We demonstrate that wing scales are abundant in the boreal forest during insect outbreak periods. We also show that due to their chitin composition, these scales remain well-preserved throughout a 10,000-year sediment record. Furthermore, they are relatively easy to identify after being recovered from lake sediments. Therefore, we introduce the needs, potential and applications of this paleoindicator in forest ecology, and the main directions for the future research. This new approach offers an important scientific advance in ecology through a much improved, higher resolution reconstruction of an important natural disturbance: insect outbreaks. Forests are complex and dynamic systems, with numerous ecological factors and processes interacting at multiples scales to create landscapes inherited from thousands years of disturbance (Messier et al., 2013; Montoro Girona et al., 2017). Until recently, most paleoecological studies, especially within the boreal biome, have only assessed the influence of wildfire as a disturbance agent (Flannigan et al., 2001; Bergeron et al., 2011). These studies rely on fossil charcoal deposited in lake sediments and peat as a paleoecological proxy of fire events (Whitlock and Larsen, 2002). However, due to the lack of effective proxies for reconstructing insect-related disturbance, the frequency, intensity and impacts of past insect outbreaks on the forest landscape have been neglected or over-simplified. Nonetheless, insect outbreaks are one of the most influential factors that shape forest diversity (McCullough et al., 1998). Spruce budworm [Choristoneura fumiferana (Clemens)] (SBW) is the most important defoliator of conifer trees in the North American boreal forest. At the epidemic stage, massive populations of larvae cause widespread damage to tree foliage. The larvae then undergo a metamorphosis to produce enormous flights of moth (Boulanger et al., 2017; Figure 1a). In the province of Quebec (Canada), the forest surface affected by this species of Lepidoptera over the last century is twice the size of the state of California (Morin et al., 2009). SBW epidemics not only have major ecological impacts but also produce important economic consequences due to the loss of forest productivity (Shorohova et al., 2011). Despite the scale and significance of this natural disturbance agent, there is limited knowledge regarding the frequency and severity of SBW outbreaks at a pluri-millennial scale as well as how these outbreaks are related to climate. Given that variations of temperature and precipitation affect organisms' survival, reproduction cycles and spatial dispersion (Dale et al., 2001), it is critical to understand the links between past SBW outbreaks and climate so as to understand the potential of SBW outbreaks under future climate change scenarios (Volney and Fleming, 2000; Klapwijk et al., 2013). Figure 1. Images from spruce budworm (Choristoneura fumiferana - SBW) outbreaks. (a) Millions of dead moths in a forest camp after a massive flight of SBW in 2014. (b) Dead moths floating on the surface of a boreal lake north of Lake Saint-Jean, Quebec, in 2017. (c) Scale belts and other components separated from moths lying on the water surface. Previous studies on long-term SBW dynamics focused on indirect measurements of the insect's activity over the last few centuries (e.g., dendrochronology, aerial surveys, inventories, etc.) (Swetnam and Lynch, 1993; Gray et al., 2000; Boulanger and Arseneault, 2004; Bouchard et al., 2006; Bouchard and Auger, 2014). Lake sediments can be considered as natural “hard drives” recording the environmental conditions and events that affect the surrounding landscape over time (Dodd and Stanton, 1990). The stored information in this ecological hard drive must be interpreted using proxy indicators found within the sediment record (Bigler and Hall, 2002; Mauquoy and Van Geel, 2007). An efficient paleoindicator must be abundant, easy to identify and remain well-preserved over a long period of time. Until recently, the reconstruction of forest insect dynamics was limited to the analysis of fossil insect feces and cephalic head capsules recovered from peat (Simard et al., 2006); these proxies do not entirely meet the required criteria. For example, feces are essentially constituted of organic matter and as such are easily degradable, while cephalic head capsules are difficult to identify and are produced in very small quantities. Most SBW studies have focused on the larval stages for which fossilized remains are not preserved in lake sediments. 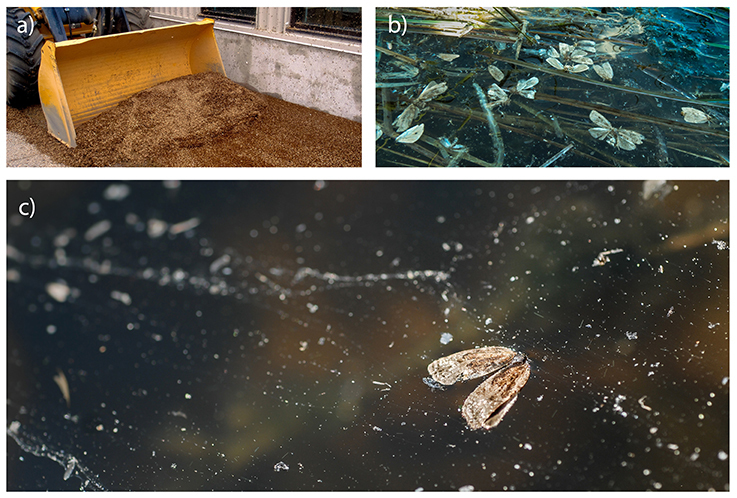 However, working in the Lake Saint-Jean region of Quebec during a recent (2014) SBW infestation, we observed large quantities of adult moth wing scales in the water column, which eventually settle onto the lake bottom. This lead us to believe that due to the chitinous composition of these body parts, the adult SBW stages could be preserved in the sediment record of lakes, and thus serve as a potential paleoindicator of outbreaks. Etymologically, Lepidoptera means “scaled wings”, although scales not only cover the wings, but also the thorax, abdomen and genital apparatus of moths. Our observations determined that significant amounts of Lepidoptera scales float on the lake surface to form “scale belts” (Figures 1b,c; Ghiradella, 1998) produced as individual die and the membranes and sockets dry, releasing the scales. In addition to the thousands of scales present on each wing of each individual moth, certain scale shapes can be associated to specific taxa allowing for specific taxonomic identification of moth species. As such, these scales seem to match a priori all criteria for being an effective paleoindicator, although previous studies had never reported them from the sediment record. Fire reconstruction uses charcoal fragments extracted from sediment by sieving methods, a technique not suitable for recovering lepidopteran scales as the mesh sizes used for charcoal are much too large. Pollen grains, studied by palynologists, are similar in size to scales, but the extraction of pollen from sediment requires the use of destructive acids that dissolve the more delicate lepidopteran remains. According to Kristensen and Simonsen (2003), the reticulated structure of lepidopteran scales renders them poorly wettable and improves their floatability. We took advantage of these characteristics to propose an efficient and relatively simple extraction protocol (Navarro et al., 2017). The procedure involves the sieving of sediment with an appropriate mesh size followed by multiple centrifugations of the rinsed sediment to precipitate the higher density organic matter and to cause lower density particles, such as some pollen and most of the scales, to float to the surface. These insect remains then form a concentrated subsample that can then be mounted onto microscope slides for analysis. This novel approach allowed us to extract lepidopteran scales from nearly every centimeter of a 500-cm-long sediment core representing 10,000 years of deposition (Figure 2). Before attributing any high abundance of fossil scales to past SBW activity, we needed to identify the extracted scales and link them to outbreak species. Given that the shape of wing scales varies between species of Lepidoptera (Anken, 1996) and that this was relatively easy to measure, we evaluated the shape of thousands of scales from the main epidemic species found in Canada. These measurements lead to the development of species-specific morphotypes that we could use as an identification support tool (Figure 3). It must be noted that with the scales being very thin and delicate, a significant portion of the extracted scales were broken, folded or covered by other material resulting in a relatively low rate of scale identification. Nonetheless, we could still confirm that peaks of identified fossil scales corresponded to periods of insect outbreak. Thus, considering the wide range of SBW outbreaks on affected areas, and as it is the most damaging defoliator, we confirm that lepidopteran scales are an excellent indicator of SBW abundance. Figure 2. Raw number of lepidopteran scales extracted for the last 10,000 years from a sediment core recovered from Lake Flévy, Quebec. Figure 3. Examples of well-preserved scales extracted from a lake sediment core showing the correspondence with spruce budworm (SBW) morphotypes generated from the shape measurements of thousands of SBW specimen scales. Analysis of the long-term history of insect outbreaks opens the door to an improved understanding of: (1) the interactions between different disturbances at the Holocene scale, (2) the role of insect outbreaks on landscape dynamics and (3) the relationship between climate and insect outbreaks at short-term and pluri-millennial scales. Use of fossil Lepidoptera wing scales also offers numerous potential insights into natural disturbance controls on forest structure with implications for biodiversity conservation and forest management. Insect outbreaks are cyclic phenomena based on the regulation of population density (Royama, 1984). Scales provide a direct measurement of the abundance of Lepidoptera over time, allowing insight into the impact of insect outbreaks on the forest structure and composition in relation to outbreak severity and frequency. Reconstruction of outbreaks would also provide a longer-term vision of insect dynamics and interactions with other natural factors over time (e.g., wildfire versus insect outbreaks versus climate). Furthermore, sustainable forestry management aims to ensure that harvest methods simulate patterns of natural disturbance and thus minimize differences between managed and natural forests (Kuuluvainen, 2002; Gauthier et al., 2009; Montoro Girona et al., 2016). Understanding the pattern of insect outbreaks will permit mirroring silvicultural practices to the natural severity and frequency of insect outbreaks (Hof et al., 2017). Finally, in the context of climate change that will likely impact the occurrence of insect outbreaks, a longer record of outbreak cycles and consequences would improve forecasts of future ecological scenarios and potential change (Intergovernmental Panel on Climate Change, 2014). Although we have focused primarily on SBW outbreaks, lepidopteran scales show great potential for other purposes. With more than 160,000 described species, Lepidoptera (moths and butterflies) is the second most diverse faunal order, with the total number of probable species estimated at almost half a million (Kristensen et al., 2007). Lepidoptera are considered to be an effective “umbrella group” for biodiversity conservation, and, globally, there is a high extinction risk for these species (New, 1997; Thomas et al., 2004). Analyses of wing scales could improve our knowledge of the abundance and distribution (e.g., migration, range shifts) of these species, and provide an understanding of how moths reacted to past environmental change, to better discern their future vulnerability to extinction. The use of lepidopteran scales from the past will provide insight into present-day ecosystems and produce a more accurate projection of insect outbreaks that will occur in the future. MM conceptualized the paper; LN and HM designed the paleoecological study and contributed to its realization; LN carried out lab work and paleoecological analyses; MM wrote the first draft of the manuscript; LN contributed to the writing of the manuscript; HM supervised the investigation and provided substantial input to the interpretation of results; HM also secured funding for the project. All authors contributed to the revision of the manuscript, read and approved the submitted version. Funding was provided by the Natural Sciences and Engineering Research Council (NSERC) of Canada, the Canada Research Industrial Chairs Program, Canada Foundation for Innovation and the Fonds de Recherche de Québec-Nature et Technologies obtained by the last author. We thank E. Tremblay for field assistance, A.E. Harvey for lab assistance, Y. Boulanger for technical advice, G. Grosbois and V. Bergeron for logistical help. Anken, R. H. (1996). On the taxonomic value of the morphology of wing scales in some Heliconiinae (Lepidoptera, Nymphalidae). Iheringia Sér. Zool. 81, 139–144. Dodd, J. R., and Stanton, R. J. (1990). Paleoecology: Concepts and Applications. New York, NY: John Wiley & Sons. Gauthier, S. V. M. A., Leduc, A., De Granpré, L., Kneeshaw, D., Morin, H., Drapeau, P., and Bergeron, Y. (2009). Ecosystem Management in the Boreal Forest. Quebec, QC: Presses de l'Université de Québec. Ghiradella, H. (1998). “Hairs, bristles, and scales,” in Microscopic Anatomy of Invertebrates, eds F. W. Harrison (New York, NY: Wiley-Liss), 257–287. Intergovernmental Panel on Climate Change. (2014). Climate Change 2014–Impacts, Adaptation and Vulnerability: Regional Aspects. Cambridge University Press. Kristensen, N. P., Scoble, M. J., and Karsholt, O. (2007). Lepidoptera phylogeny and systematics: the state of inventorying moth and butterfly diversity. Zootaxa 1668:e747. Kristensen, N. P., and Simonsen, T. J. (2003). 2. ‘Hairs' and scales. Handbuch Der Zoologie/Handbook of Zoology 4:9. Mauquoy, D., and Van Geel, B. (2007). “Plant macrofossil methods and studies: mire and peat macros,” in Encyclopedia of Quaternary Science, ed A. E. Scott (Amsterdam: Elsevier Science), 2315–2336. Messier, C., Puettmann, K. J., and Coates, K. D. (2013). Managing Forests as Complex Adaptive Systems: Building Resilience to the Challenge of Global Change. New York, NY: Routledge. Morin, H., Laprise, D., Simard, A.-A., and Amouch, S. (2009). “Spruce budworm outbreak regimes in eastern North America,” Ecosystem Management in the Boreal Forest, eds S. Gauthier, M.-A. Vaillancourt, A. Leduc, L. De Grandpré, D. Kneeshaw, H. Morin, P. Drapeau, and Y. Bergeron (Québec, QC: Presse de l'Université du Québec), 155–182. Whitlock, C., and Larsen, C. (2002). “Charcoal as a fire proxy, in Tracking Environmental Change Using Lake Sediments, eds J. P. Smol, H. J. B. Birks, and W. M. Last (Dordrecht: Kluwer Academic), 75–97. Copyright © 2018 Montoro Girona, Navarro and Morin. This is an open-access article distributed under the terms of the Creative Commons Attribution License (CC BY). The use, distribution or reproduction in other forums is permitted, provided the original author(s) and the copyright owner are credited and that the original publication in this journal is cited, in accordance with accepted academic practice. No use, distribution or reproduction is permitted which does not comply with these terms.